8 April 2006: In Africa, the process of urbanisation is faster than in any other region of the world. In sub-Saharan Africa, an estimated 72 per cent of the urban population live in slums while in North Africa the figure is 28 per cent. In addition to appalling health conditions and lack of access to basic services such as water and sanitation, those living in slums and informal settlements are regularly exposed to forced evictions. 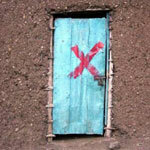 Forced evictions - that is those carried out without sufficient justification, consultation on alternatives to eviction, due process of law, and assurance of adequate alternative accommodation - have been recognised by the UN Commission on Human Rights to be a gross violation of a range of human rights, including the right to adequate housing. In light of the ongoing and growing crisis in urban housing in Africa, Amnesty International, the Centre on Housing Rights and Evictions (COHRE), Kenya National Commission on Human Rights (KNCHR) and Hakijamii Trust called on African governments to adopt concrete and human rights-based strategies that ensure the poorest members of African cities can live in human dignity. 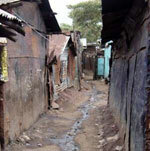 On World Habitat Day on 3 October 2005, the UN Secretary-General Kofi Annan stated that the ‘build-up of slums and informal settlements occurs in large part because of policies and exclusionary practices that deny public services and basic facilities - including water, sanitation, health and education - to informal settlements’ and that ‘evictions and demolitions are not the answer to the challenges of rapid urbanization. We must have pro-poor, participatory urban development… with respect for human rights and in accordance with international law.’ These challenges and strategies were recognised by AMCHUD in its 2005 Durban Declaration and Enhanced Framework of Implementation and Related Outputs. The ministerial meeting in Nairobi provided an opportunity for African states to pronounce themselves opposed to forced evictions, to develop strategies to tackle housing problems in a manner which respects human rights and to learn best practices from each other. For example, Kenya is adopting guidelines to prevent and remedy forced evictions; Botswana has developed a system of certificates of occupancy to ensure secure tenure for residents of informal settlements; South Africa has developed the Prevention of Illegal Evictions Act, which provides for a rights-based approach to evictions and has enabled activists to challenge forced evictions in the courts. At the same time, across Africa hundreds of thousands of people each year are forcibly evicted, in many cases being left homeless, losing their possessions without compensation and/or being forcibly displaced far from sources of employment, livelihood or education, all in violation of international law, including the African Charter on Human and Peoples’ Rights. Forced evictions in Angola since 2003 have led to displacement of over 5,000 households and the further displacement of hundreds of internally displaced persons (IDPs), and have been accompanied by excessive use of force and grave violations of human rights. Since 2000, forced evictions in Nigeria have left over 2 million people destitute and resulted in serious violations of many other human rights, including rights to health, education and the right to be free from cruel, inhuman and degrading treatment. In Zimbabwe, a government campaign of mass forced evictions in urban areas during 2005 destroyed communities countrywide and pushed the country deeper into humanitarian crisis. In the last year in Kenya, tens of thousands of dwellers, including indigenous peoples, were violently evicted from forests without resettlement while many informal settlements in Nairobi have been subject to intermittent demolitions. In Sudan, mass forced evictions, including of IDPs, in and around Khartoum are of concern: in August 2005, residents of Shikan camp were forcibly displaced to Fateh III, which lacked even minimum levels of essential services. Further relocations, many likely to involve forced evictions, are scheduled to take place in the near future, as the government has announced the re-planning of all ‘illegal’ settlements. 1. Develop a human rights based framework for upgrading slums and informal settlements which secures opportunities for genuine community participation and forms part of a plan to achieve progressively the full realisation of the right to adequate housing for all. 2. Develop guidelines and laws to prevent and remedy forced evictions and declare a moratorium on all evictions from slums and informal settlements until such time as human rights based housing legislation and policies are adopted. 3. Develop innovative communal and individual land tenure schemes that guarantee a degree of security of tenure to all immediately and establish and implement plans to provide affordable serviced land for low-income housing development. 4. Prioritise the poor and other vulnerable groups, including those living in informal settlements, in the allocation of financial, technical and other resources for the progressive fulfilment of housing and related rights, including the provision of sufficient safe and affordable water, sanitation and other essential services. 5. Allow rapid and unimpeded access to victims of forced evictions by local and international humanitarian organisations where the state is unable or unwilling to provide humanitarian assistance. Urban poverty is one of the biggest challenges facing African countries. According to UN-Habitat, currently two-thirds of Africa's urban population live in informal settlements without adequate sanitation, water, transport or health services.